Home » ★★★★☆ » The Palomar. Party time. I didn’t get to hear the drum thing. It’s the owner’s special party trick; a little percussion medley, using the pots and pans in the galley kitchen, whilst customers perched on their barstools drink shots. Obviously the very thought of having that sort of display going on in front of me brings me out in a peculiarly British sort of rash, but I’m told it’s something to see. I’m sure it’s very entertaining. There’s a video on YouTube if you’re desperate to see it. I’d asked my partner and friend B to join me, at short notice, for a trip to the Middle East in Soho. I can always count on her to say yes to a 12 o’clock start, given that she starts work before most of us have got out of bed. And because she is always at least ten minutes early, I was hyperventilating when stuck in a cab in Knightsbridge in heavy traffic at ten to twelve. I do so hate that moment when you realise that the tube is going to be quicker and you have to admit taxi defeat. I’m sure the Germans have a name for it. So she had already scanned the menu at this little bit of Israel, on the outer edges of Chinatown, the most recent of the new wave of Israeli/Mediterranean food joints, Honey & Co my personal favourite. The Palomar serves food from Spain, North Africa and the Levant, it’s certainly not kosher (I give you pork belly tajine) and it is a million miles away from the sort of thing you might get in restaurants of the may-it-rest-in-peace Blooms variety. None of that heavy Eastern European food here, although I did spy a latke. 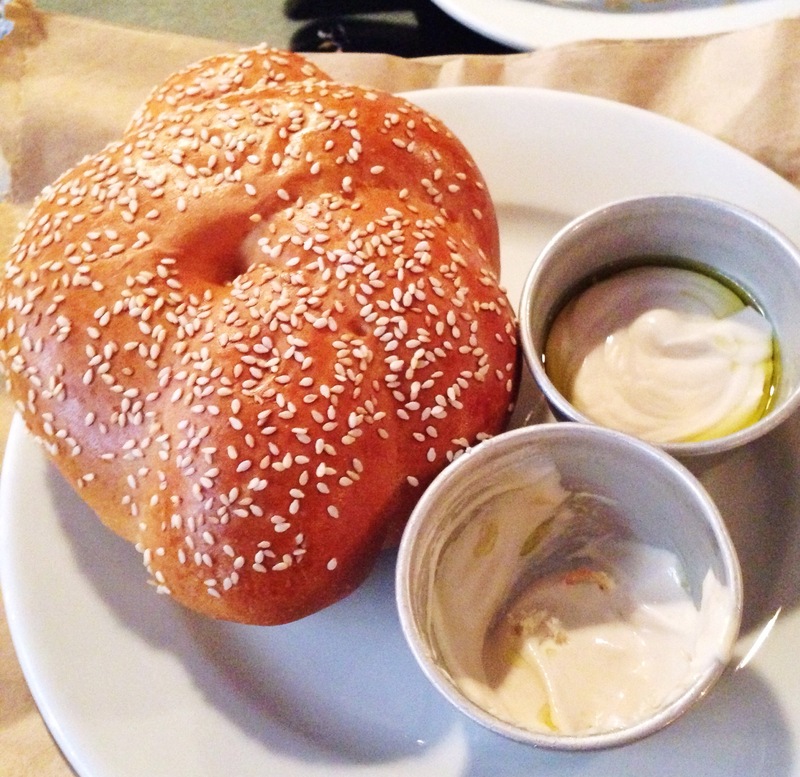 The first thing I notice on the menu is Challah, which seems rather North London trad to me. For those of you who may not have come across it, I am envious, because you can experience carbohydrate nirvana for the first time. Egg-enriched white bread, it is traditionally sprinkled with sesame or poppy seeds and washed with egg yolk. 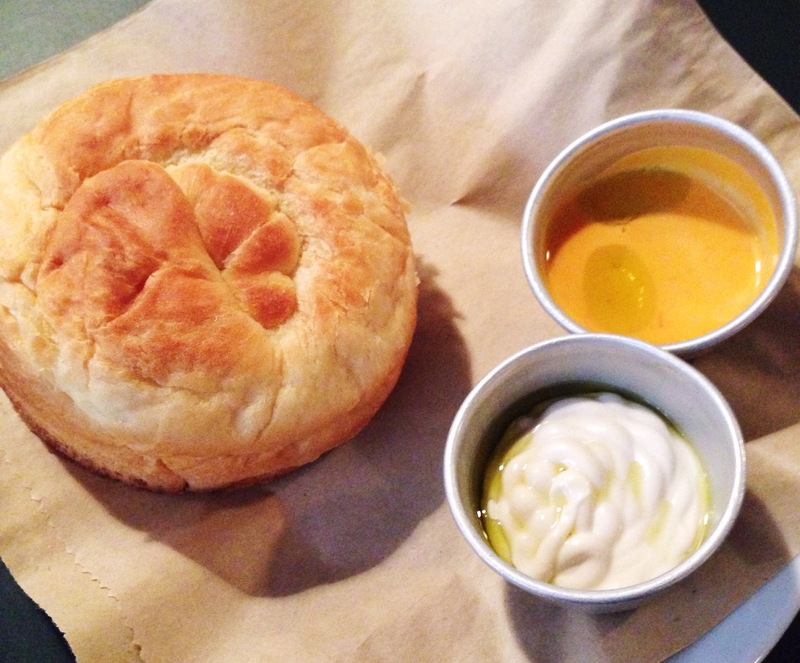 That description does not do justice to the wondrous small challah loaf which I ordered almost as an afterthought. And to think, I might have missed that delicate crisp crust, those sesame seeds, that light as a feather interior and that entirely unnecessary but entirely wonderful sesame paste dip. Free tip: challah makes the best French toast you will ever taste. I was worried, because the Daily Six, advertised as “assorted mezze from Jerusalem and beyond”, did not come with a side order of pita bread, which would have been its natural partner. Of course, we had already ordered the Kubaneh, a brioche-style Yemeni pot-baked bread, served with tahini and what they call velvet tomatoes, and it should have been enough to cover us for the mezze and it would have been, had we not already eaten most of it by the time the mezze arrived. 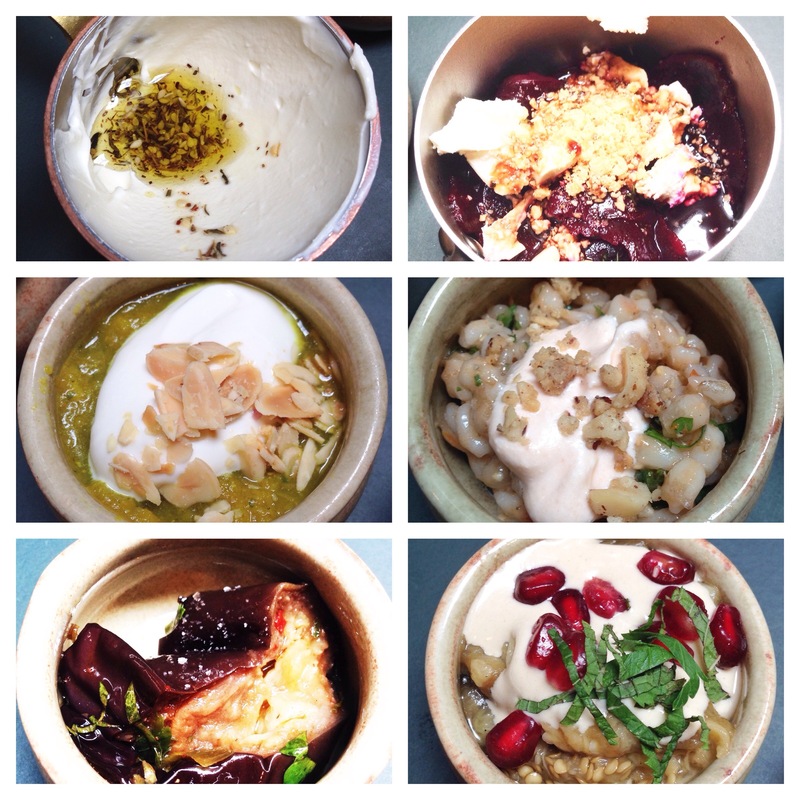 This was six small pots of flavour, a cheesy- yogurty-minty thing (labneh) here, some lentils there, a gorgeous dish of braised aubergine, a sharp one of smoked aubergine and yogurt and a beetroot and goats’ cheese combo which I liked least. The lentil dish, my favourite, was brought to life with a unexpected layer of pickled cucumber. Some dishes were better than others. Fortunately B preferred the others. The perfect dining companion in a sharing scenario, everything I loved, she could live without, everything she wanted more of, I was happy to give her. And so I was able to eat the majority of the corn-fed chicken cooked in buttermilk and Jerusalem mixed spices, with baby carrot and freekeh. Which I loved. If you are a foodie-type person, you will know what freekeh is. It’s the new quinoa (pronounced keen-wah, by the way – you’re welcome). And by that I mean it’s the new must-have ingredient de nos jours. So what is this wondrous thing, you may well ask? It’s an ancient roasted wheatgrain with a nutty texture and a ridiculous name. It tasted good though. Better than keen-wah. 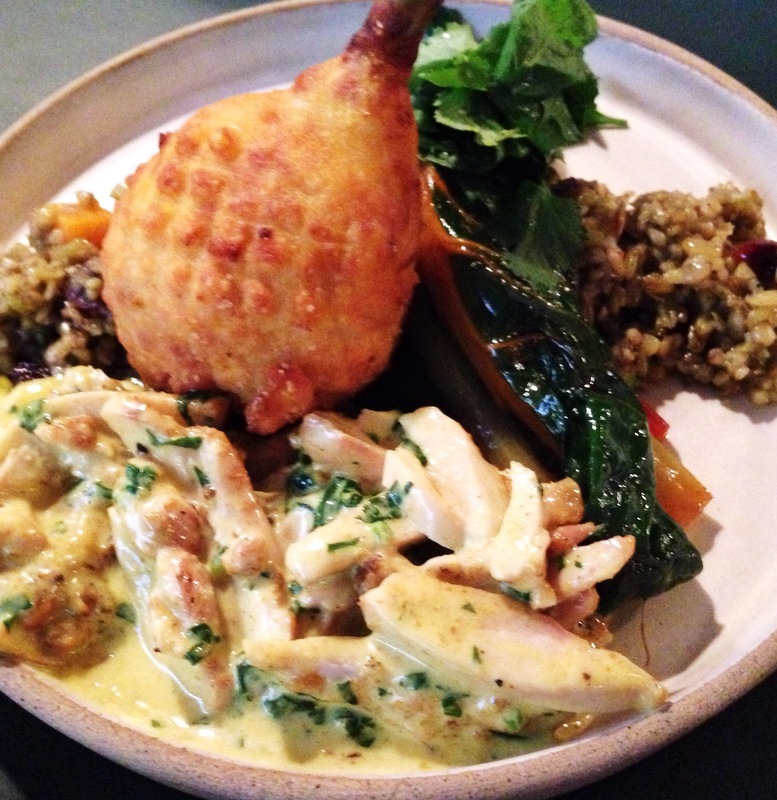 And the chicken leg was deep fried with a buttermilk coating and there was a substantial amount of sliced chicken meat in a curried sauce, as well as the freekeh, topped with herbs and lemon-dressed chard. God it was good. More conventional was the sea bass, cooked in the Josper grill. Lesson no 2: A Josper grill works with charcoal at an average temperature of between 572°f and 662°f. Which is hotter than hell. 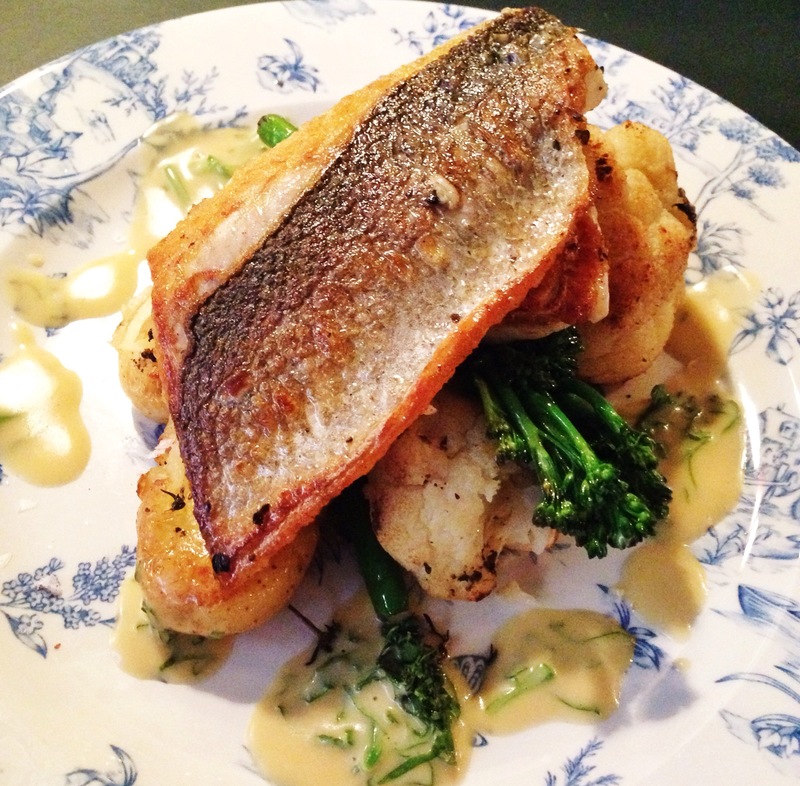 And this meant that the fish was crisp yet moist, sitting on its bed of cardamom crispy potatoes and braised cauliflower. I liked it, but I wanted the whole stuff you can’t get anywhere else thing and this was a little too playing it safe, given the other items on the menu. Yes. I know we ordered it and of course B loved it, but me? I wouldn’t go there for that. 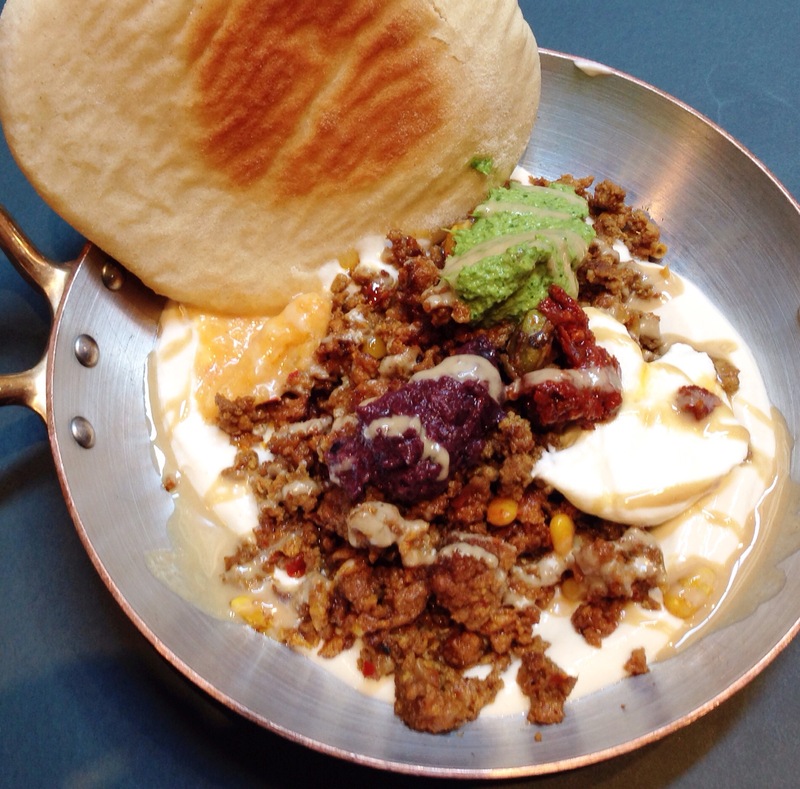 Not when there’s Shakshukit, the deconstructed kebab with minced meat, yogurt, tahini and pita croutons and The 4 tops. . Which I had last time. And which I regret not having again. But unless they take it off the menu, I’m sure that I will be eating it again because I’ve only scratched the surface of the menu and this is just my sort of place. I must have the Fattoush salad, likewise the polenta, Jerusalem style, with truffle, not to mention that pork belly tajine, with Ras-el-hanout dried apricots and couscous. And if you don’t like the sound of all that, then I am not sure that I can be your friend and perhaps we ought to call it a day. Finger lickin’. We freeked out. Jospered. On your nan’s plate. Here’s one I had earlier. Shakshukit. Chocolate Cremeux from summer. 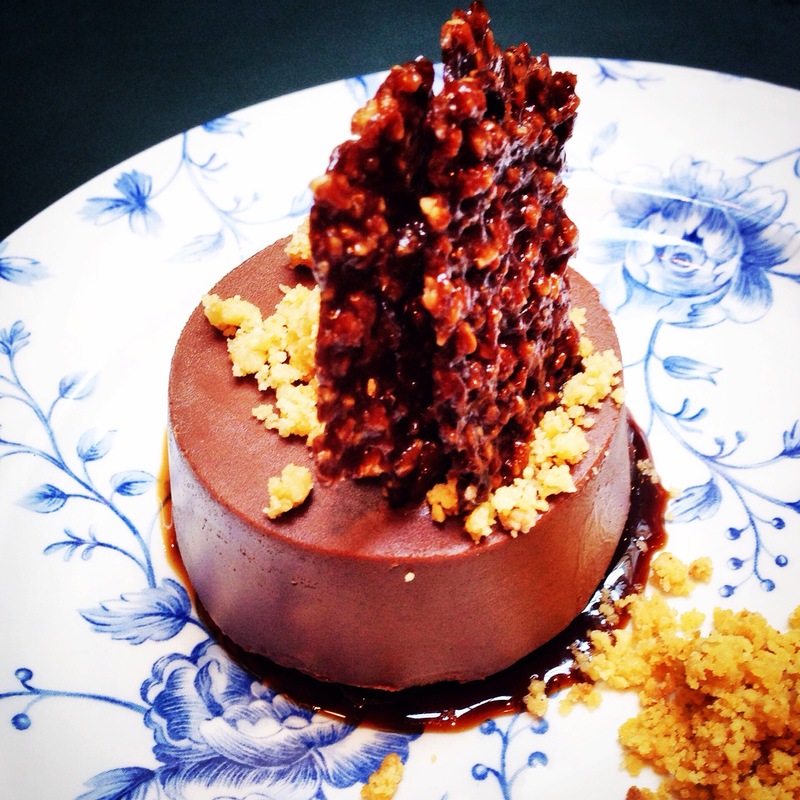 Puffed rice crunch, pomegranate coulis, cocoa tuile and almond streusel. In case you have room. Great revue as always,out of interest what is the typical cost of such a meal for 2 ?